For this round of the Blog Hop, Louise of Priestess Tarot asked us to commune with someone from across the veils, which are said to be at their thinnest this time of year. While she suggested coming up with cards that would describe them, I decided to try doing a reading to hear what they had to say. And as this is a Lenormand blog, who better than Mademoiselle Lenormand herself? The first thing I notice is that the Lady stands in the bottom left corner, facing away from the rest of the cards. Although some would throw a GT again if it came out like this, it seems appropriate. For it is certainly true that Mlle Lenormand herself has no future, though the cards that carry her name may be a very different story. The main theme of the throw is Snake, Anchor, Lady, Flowers. Mademoiselle worked both intelligently and creatively. Not only did she push her limits outward, using her gift for connecting with people socially, she also quickly grew her working reputation. She was dedicated to building her own image, and didn't allow her gifts to be boxed in by religion or politics, even when imprisoned. As for the heart of the reading: Tower, Bear, Dog, Storks. Strong people in positions of authority called her friend and helped her progress. She certainly had a talent for getting in with the cream of society, and they all wanted to know about what would help them move onward and upward, too. So, a strong affinity in life focus helped her get where she went. I wanted to look at her reputation, as it was what led to these cards being named after her, despite her never actually using them. So, I started with the House of the Moon and followed the cards around til the Moon card: Anchor in Moon, Letter in Anchor, Lily in Letter, Cross in Lily, Fish in Cross, Moon in Fish. Two readings of this sprang to mind. Firstly, Mademoiselle worked on her reputation through her written works. She found peace through writing, yet that sense of harmony was burdened by the need to make money, for which she had a reputation. Secondly, her reputation worked to bring about the publishing of Lenormand cards, using also the work of an older man (Johann Hechtel, who created the Game of Hope, the direct precursor of the modern Petit Lenormand deck). The ethics of this were ignored in favour of making money from her reputation by the publishers who combined his deck and her name after both their deaths. What did she love? I look to the cards around the Heart and find: being socially connected and secure, in the thick of what was going on (Rider in House); in the know about gossip and seeing both sides of some situations (Birds in Clouds). She also loved having insight into what was being done on the sly (Stars in Fox), constantly finding new mentors/supporters (Bear in Child) though her emotions were also impacted by worries around institutions (Tower in Birds). Well, as someone who was imprisoned several times over the course of her life, being wary of Towers sounds pretty common-sensical! Looking to the final line, the destiny four as some people call them: Book in Key, Moon in Fish, Letter in Anchor, Fish in Cross. What it says to me is that her reputation for being able to navigate the emotional waters of esoteric secrets gave her a solid grounding for her authorhood. It directed her to her destiny, to write copiously and make money from it. It is doing the same for the cards that hold her name, and I think she would like that! Very cool subject, and your cards laid out in a GT are stunning!!! Will's artwork is beautiful as always! Interesting reading of Mlle. Lenormand's life. 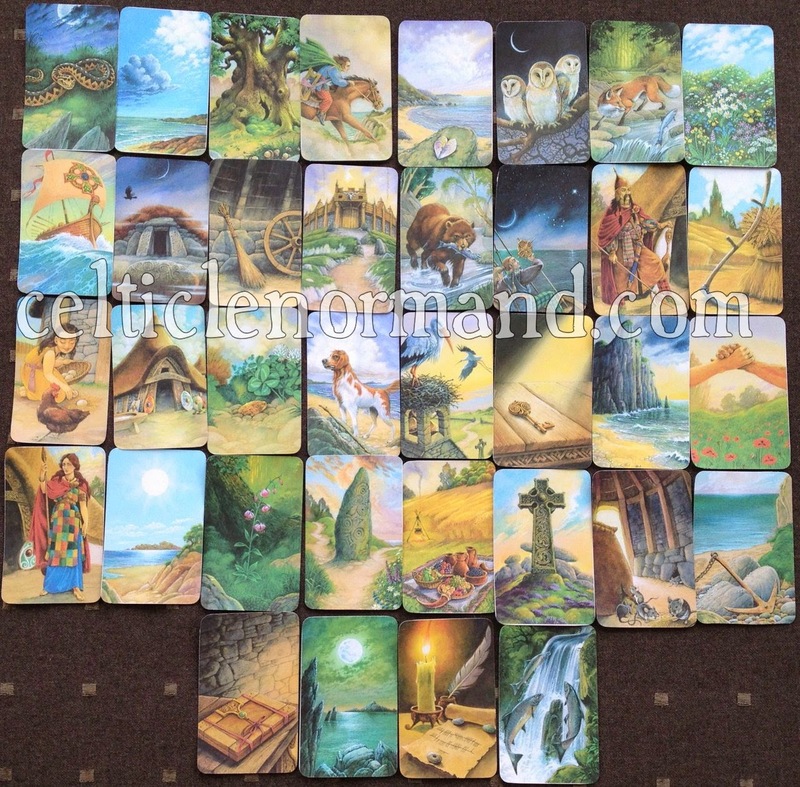 I've learned a little more about how to use the Lenormand deck, thanks to your post! Lovely illustratiion (and I don't just mean Will's art) of a little-known (to me, at least) life. Thank you! This is an amazing deck. Can't wait to get my hands on it! That reminds me, I actually met a Brittany (spaniel) the other day. Recognised the breed thanks to your card :D Although they are quite common hunting dogs in France, it's an unusual breed to see over here.